The partnership between Rabcat and Microgaming is one that brings out the best in the latter and this new River of Riches slot is an example of that relationship proving to be a success. If you are looking at the reels and thinking “Indiana Jones” then I don't blame you. 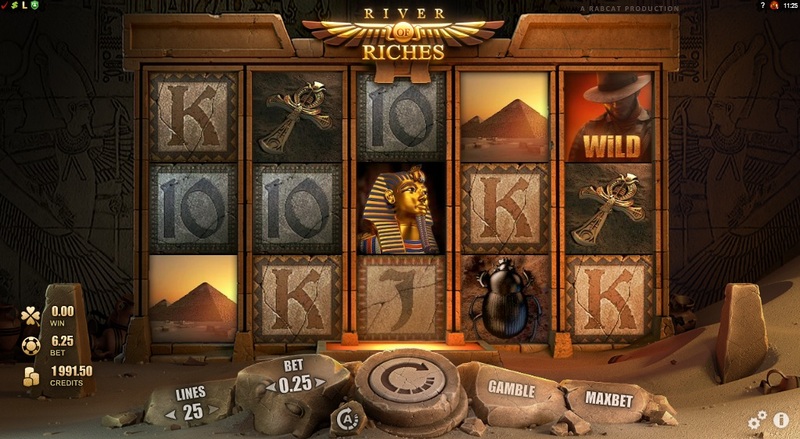 River of Riches is a 5 reel, 25 payline slot with an Egyptian theme. It does feel incredibly like Play'n Go's Aztec Idols slot with the whole treasure hunter vibe and the graphics are actually to a standard where it could be mistaken for a Play'n Go title. It looks like the reels are set in an Egyptian tomb of some kind. It is surprisingly atmospheric. The symbols on the reels include a Sphinx, an Ankh, a pyramid, a scarab, and the regular 10-through-to-King symbols. These might be stereotypically Egyptian-themed symbols but they do add to whole character of the slot. The Wild is represented by the treasure hunter and this substitutes for all other symbols, except for the Scatters, to complete any potential winning combinations. This is not where the Wild influence on this game ends but more on that later. Free spins can be triggered on this slot. You will need to hit three or more of the Isis symbols across the reels. This will immediately reward you with 10 free spins. Hitting five of the symbols can see you also earn a 12x multiplier on any wins you hit on that spin. It is also possible to re-trigger these free spins. Now, we mentioned about the Wild still having more influence. When the free spins are triggered, one to four Fixed Wilds will appear on the reels for the duration of the free spins. These Fixed Wilds look different to the normal Wilds and are represented by a fiery Wild icon. 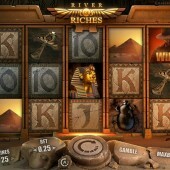 River of Riches might echo of other Egyptian-themed slots. We've already mentioned Aztec Idols and it certainly holds resemblance to the Riches of Ra slot that is also from Play'n Go. However, this is a competent slot in its own right. The Fixed Wilds in the free spins gives that bonus feature an extra bit of excitement and the regular game play can see you earn some decent pay outs with the Scatter wins. It could do with an additional bonus game and in the grand scheme of things it isn't a slot that will alter the landscape of the market. I did enjoy it though and provided you avoid the temptation to hit the Gamble feature then you can get some nice wins out of this slot.